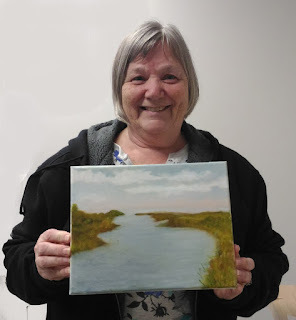 This is one of my students from my last Alla Prima Oil Painting class and her lovely landscape painting. We started this class with an exercise on value control and then we created a couple of landscape paintings using the alla prima method. This class covers what you need to know regarding supplies, fat over lean, support and how to care for your supplies. We also focus on color mixing, seeing as an artist, edge control as well as what we need to consider as artists when creating paintings.